Have you ever wished that here was a simple, straight-forward way to transform everything about your smile? Lumineers are Dental Veneers made of thin porcelain that bond directly over your natural teeth, instantly changing a person’s smile. A Veneer is a material over-lay usually on the showing side of the tooth. They are used primarily for improving appearance which could mean color/shade or physical shape. The only thing holding a veneer to the host tooth is the fit, the adhesive glue with a minimal functional force against it. A Lumineer is a proprietary veneer (brand). 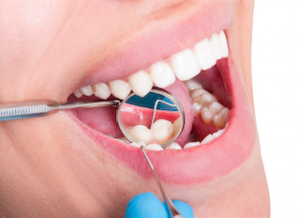 Although veneers are widely accepted, they do require exceptional judgment and skill in the clinician and a realistic expectation of the patient regarding possible displacements or fractures. I was one of the earliest dentists in the area to use veneers. I love them, but will not place veneers on every patient. The concept is not appropriate for every patient. At Healthy Body Dental, we use Lumineers. This special type of dental veneer is considered “no prep,” which means the process is comfortable and does not require any alteration to your natural teeth. Each Lumineer is custom-designed to fit over your tooth similar to the way a contact lens fits closely over your eye. The custom shade, shape, and color of the Lumineer means the overall appearance of the tooth is instantly changed as soon as the Lumineer is permanently bonded into place. No anesthesia is necessary! I have to admit; finally deciding to get the Lumineers was a major decision and one that did not come quickly or easily. I wasn’t sure if the difference they could make would justify the effort and expense, but Dr. Adams and his staff reassured me of what could be accomplished. All I can say is “WOW what a difference”. And not just the outside physical aspect of improved cosmetics, but the emotional feeling of being able to be relaxed and yourself. Whether its photography or greeting someone, I can smile knowing everything is alright. The only regret I may have is one many others have probably expressed. “If only I had done it sooner”. Rtein Z – Lumineers was a major decision – “If only I had done it sooner”. I really can’t even begin to explain to you how lucky I feel to have found a dentist and a friend such as yourself. I say friend because since the moment I walked into your office, you and your staff have treated me like I was a family member. It is not very often in today’s business oriented world that you meet someone that truly cares about their client’s wellbeing. Someone who is willing to go the extra step to make a patient feel comfortable and at ease. I have been self-conscious about my teeth for as long as I can remember. When I first came to your office, I explained to you and your staff and it seemed as if you were all as excited to help me with that problem as I was to get it solved. As we began the process I became more and more nervous because of my own neuroticisms but every time I did, you were patient and kind and helped me through my concern’s, Then the day came when I had the lumineers actually put on and I saw my new smile for the first time. I really can’t explain what it was like to look in the mirror and see the self-conscious part of my mind just fade away into oblivion. I find myself going to the mirror daily and just smiling for several minutes and every day I am as excited as I was the first time I saw my new smile. Because of my fear of dentists, I probably wouldn’t have ever gotten my teeth fixed because of the long history of impatient and rough dentist I have encountered. Because of you and your patience and kind attitude towards me, I am able to overcome one of the biggest fears I had and get the result which is the great smile I have now, I really can’t thank you enough. I am forever in your debt.